This episode is one of my favorites in the entire season, and for a number of reasons. I’ll break it down one by one, lest I ramble off into the night. First off, this episode is packed with references to Alice’s Adventures in Wonderland and Through the Looking Glass, including – but not limited to – the entirety of the scenes in Yellow Moya, which is massively influenced by the Mad Tea Party. That notwithstanding, this is the first episode where we see that the crew (for lack of a better term) is starting to become more of a family. We’ve seen it before, where Zhaan has been a mother figure for everyone else, but the cold open at the dinner table really shows how they’re starting to adapt to each other. Contrast that especially with the closing scene, likewise at the dinner table, where everyone is joking with each other and generally behaving like a family. The familial relationships become a lot more noticeable in later episodes and seasons, but if you look carefully, you can start to pick them out here. We’ve already covered Zhaan in the motherhood role, both as Den Mother and Mama Bear. We see both of these in this episode, both with her looking after Chiana and Pilot, while simultaneously brandishing one of Aeryn’s pulse rifles at anything threatening her compatriots. Chiana is really starting to get development time here, and it’s only a matter of time before she gets added to the credits. She has a lot of deconstruction ahead of her, but we’re starting to see a bit of a bond forged between her and Crichton; he’s the one who looks out for her, calms her down when she’s freaked out, while simultaneously yelling at her when she’s being a brat. In short, he’s treating her like a kid sister – even going so far as to affectionately refer to her as “Pip”. Likewise, Pilot is the precocious younger brother, or possibly younger cousin. Unsure of himself, very open with his feelings and emotions, and always apologetic when he messes up. D’Argo is the Older Brother With Something To Prove. He wants to be the Patriarch of the clan, but his inexperience and zeal complement his tendency to seek affirmation from his shipmates; he wants to be seen being a good leader and do a good job, and tends to overcompensate and show off. Moya’s a lot harder to lock down; she’s simultaneously a mother figure, a helpful aunt, and a bashful servant; all of these together tend to work against her, since she’s overlooked and underappreciated, and often tries to prove her worth – which is what gets us in this episode’s Predicament Of The Week. I don’t remember if we’re ever told how young Moya is, in relation to other Leviathans, but she often strikes me as being as young (comparatively) and unsure of herself as Pilot. Speaking of Moya, this episode is yet another example of her being a full-fledged character in her own right: She admonishes the crew – through Pilot – and tells them that while they’re sitting down, talking about leaving her? She can hear every word. This was originally pitched as an episode of Star Trek: The Next Generation. It definitely feels like something that would have worked well in that medium, but I’m glad they weirded it up for us here at Farscape. Pay attention to the music in the fragmented realities. In Painful Light Red, it’s harsh and jarring, with a lot of unsettling noises and minor chords. With Can’t Hear A Thing Blue, it’s a lot more fluid and high-pitched. Finally, in Mad Tea Party Yellow, it’s decidedly strange and sticks to the background. Tea Party Rygel. I’d talk more about it, but I’ll just reprint his attempt at Carrolling Through The Night. That Sixteenth Rygel, glory Me, must travel in reverse! I’m really not sure where to start with this one. It’s an amazing episode with a solid concept for a one-off drama, but it’s full of many great little moments to discuss instead of sweeping issues. Well, there is the family aspect, but Kevin already covered that, and all I can really add is that I like how the plot relies on them to simultaneously unify and divide as they have to kick in the engines of the separate Moyas, all at the same time. They have to trust each other, function as a team, which is increasingly easy as John has ideas and D’Argo, Zhaan, and Aeryn put up little, if any, fight before going with it. Rygel is still pretty useless as he gets stuck in the laughy dimension and goes into a routine of hilariously awful jokes, but I like how Chiana is still clearly labelled an outsider. John has to forcibly yank her along to get her to go anywhere, and I like the additional touch of her completely refusing to be stay behind and help in a dimension, even though it doesn’t have the same devastating physiological effects on her senses as it does the others…. only for karma to repay her selfish choice by dropping her in a plane where a sonic barrage that’s annoying to them leaves her completely crippled in shock. However, while still the reject among rejects, to the point where everyone in the opening meal responds to her repeated pleas of “Can I say something?” with a synchronized “No”, I find it telling that she’s the only one who realizes that Moya still has ears and is listening in on their discussion about abandoning the ship. She’s become the new John, the one the others roll their eyes at even though her fresh take on things is picking up what they missed in their complacency. And speaking of John, did anybody else catch the moment when Pilot called him Commander? A slip of the tongue, or some deeper sign of respect? How do you get laughs out of the disgusting act of John vomiting on screen? D’Argo’s reaction. Priceless. Speaking of priceless, look at Aeryn’s little smile of amusement as John is trying to describe Rygel through charades. Speaking of Aeryn, great use of callbacks. Not only to her knowing Pilot’s control console through their partial DNA mix, but to the joys of science she discovered in “Thank God it’s Friday. Again.“, which allow her to modify some comms to counteract dimensional interference. I love Rygel’s little verse, but are translator microbes really good enough to retain a rhyming scheme? Pip. Sparky. Big Guy. Blue. I can’t remember, but does John ever come up with nicknames for Aeryn, Pilot, or Moya? I like how there’s a map of “Eversion Points” John can follow as things increasingly slip into Run, Crichton, Run territory, but that doesn’t explain why, in the beginning, D’Argo and Aeryn visibly disappear at points the others can’t follow through. Did anybody else find the prime numbers realization a bit forced? Not sure why that revelation of intelligence from the Langoliers doesn’t quite work for me. It feels too sudden, too random. Unless you’re an Iron Chef, cooking human dishes with alien ingredients is not likely to produce good results. Let this be a lesson. Love the bit where John takes the Peacekeeper rifle from Chiana, only for her to instantly produce another. 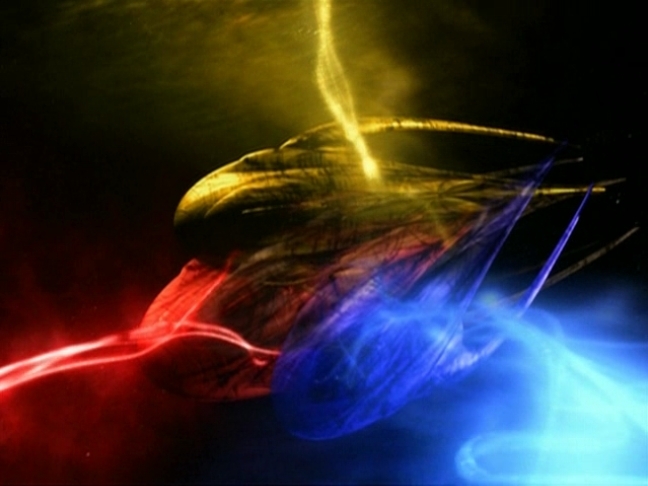 This may be the introduction of ad libs to the Farscape universe. I can’t see half of the Yellow Moya events going on without someone making something up on the fly. And Ben Browder says (much, much later on) that you know you’re in real trouble when the muppet starts ad libbing. Going to get the Eversion references out of the way quick to avoid breaking Tessa. So, skip the next paragraph if your mind has ever cracked under the crazymaker. I love the sound cues on the Eversion points. The crackling chirping sound is a fantastic immersive element. The different Moyas come color-coded for your convenience: White Moya is Eversion world 1, relatively normal. Yellow Moya is Eversion world 2. Blue Moya is world 6 with the crazy-making music. And Red Moya is world 7 complete with heartbeat. Zhaan’s priestly vestments make a return. She’s still tackling her dark impulses, but she’s coming to terms with them. The crew is helping out a lot with that. Kevin nails that on the head – this may be the first episode where everyone really gets along and acts as a cohesive unit. Crichton’s title of “Commander” is his IASA rank. It’s used a couple times in the pilot and previous episode. Pilot uses it occasionally. There’s something odd about the closing credits in this episode. They’re longer than usual. I only noticed it because the music looped once, but I couldn’t find anything new in them. Not that I was paying strict attention. I may have been distracted by my notes on the show. Damn you, Eversion. Even from beyond the grave of my Recycle Bin, you still haunt me. This was a very interesting episode, flashbacks to the bane of my existence aside. The boys covered most of what I’d think to go over, but there are a few extra observations I’d like to touch on. The crew highlights an interesting point early on during their argument: Crichton is the only one out of the crew (save for Chiana, maybe, we don’t know enough about her yet to say) who wants to remain in the Uncharted Territories. His only conceivable way home is there, while the others (again, possibly with the exception of Chiana and maybe Aeryn) all have homes to return to outside of there. It’s not given too much attention here beyond the brief back and forth, but I can see that possibly resurfacing as a potential conflict later on. What happens when the ship has the opportunity to take the crew away from the Uncharted Territories? We saw Crichton completely disregard Aeryn’s safety and freedom earlier in the season when he very nearly took the both of them through a wormhole after stumbling upon the revelation that they could be replicated. His desire to return home may have been tested in the last episode, but it seems pretty clear that it’s still a goal with a pretty powerful grip on him. What happens if he’s put in a position where the already remote capability of returning home threatens to go away completely? 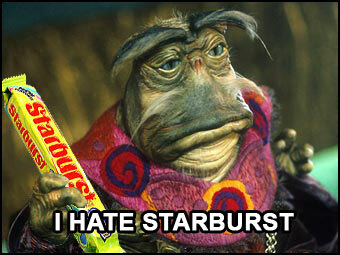 And, as we all know, Rygel hates Starburst. I like how we get Chiana’s character basically summed up by her in about a sentence. “I thought you were Junior Miss Tough Chick of the Universe.” “Well, yeah. When I can kiss or kick or cry my way out of it.” Also, that look on her face when she realizes that she really can’t leave the ship even if John would let her? It’s such an amazingly tiny change on her face, but she goes from looking annoyed to terrified. It’s incredibly subtle acting, and it’s so effective. Speaking of the acting, the actors continue to impress the hell out of me. It takes a lot of skill to be able to convincingly get the extent to which the different “worlds” are affecting the characters, and none of it looks forced. The effects help, but this could have easily turned narm-y with actors that weren’t as skilled. It’s easy to act like you can’t hear someone, or to act goofy and giggly. It’s harder to convincingly act like the reason you can’t hear them is because of an extremely loud noise bombarding you while you’re trying to hear them, or that you’re laughing because you really can’t help it, even though you’re trying like hell to resist. Also, I’d forgotten just how big Pilot is compared to the other characters. We usually only see him on a screen, and it’s easy to think of him as being roughly on the same scale with the others. Seeing John stand next to him and actually interact with him, it’s interesting how tiny he looks in comparison. I agree with Noel that the “prime number” revelation seemed a tad odd. I guess John needed to reach the realization that the being wasn’t hostile, but he seemed to reach that conclusion a little too easily for what I thought was a very obscure reason. Weston wrote: Crichton’s title of “Commander” is his IASA rank. It’s used a couple times in the pilot and previous episode. Pilot uses it occasionally. Huh. Guess I just never picked up on it before. Tessa wrote: Also, I’d forgotten just how big Pilot is compared to the other characters. […] Seeing John stand next to him and actually interact with him, it’s interesting how tiny he looks in comparison. I love Ben Browder trying not to react as he’s repeatedly knocked in the back of the head by Pilot’s frill. I honestly found it unbearable. Not only do i consider this the worst Farscape episode…i consider it one of the worst episodes in TV history.